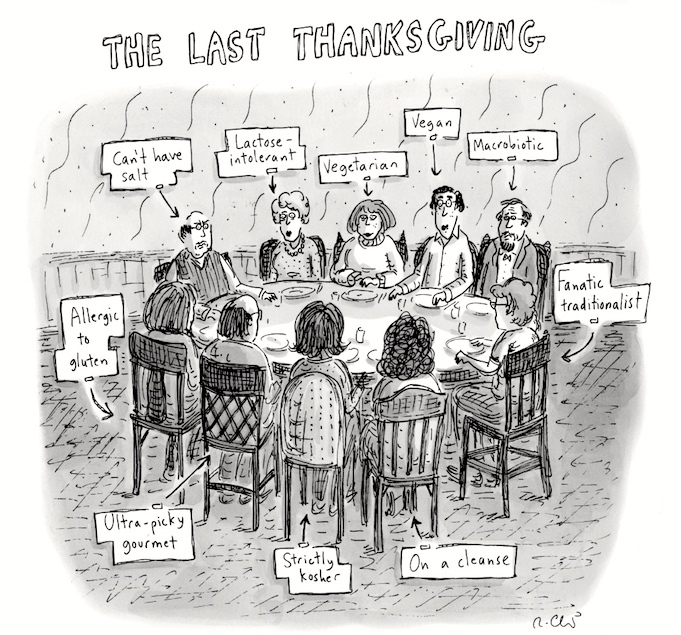 A Roz Chast New Yorker cartoon from 11/22/10, “The Last Thanksgiving” — how could I possibly please them all? 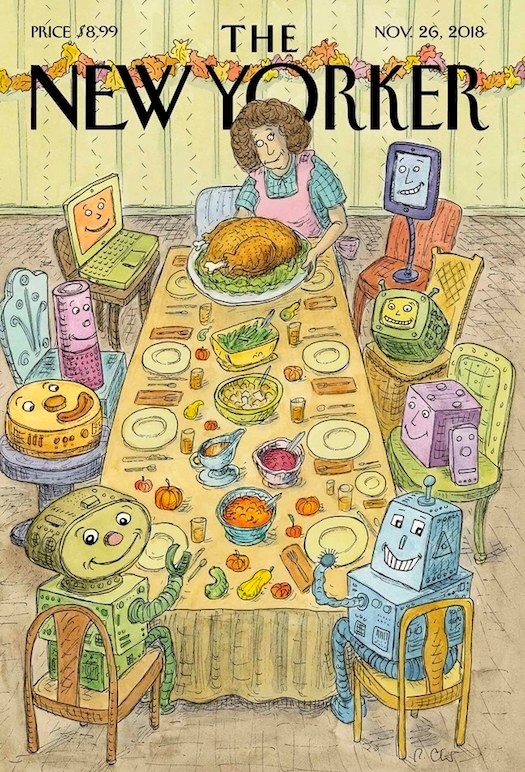 — and now her cover for the latest (11/26/18) New Yorker, “Thankfulness”, for the Technology Issue of the magazine. The title is a play on the first Thanksgiving, referring to the 1621 celebration at Plymouth involving Pilgrims and American Indians. But after the Thanksgiving dinner pictured above, there will be no more — at least, not with this crew. The cartoon illustrates one feature of the archetypical Thanksgiving meal: relatively large numbers of ill-assorted guests, who rarely (if ever) otherwise gather together. Not visible in the cartoon: a mind-boggling amount of food, in large quantities, with a gigantic roast turkey as its centerpiece. In principle such a spread provides something to please everyone, but that plan can go awry — if some guests find certain dishes actively revolting (some people are done in by the pervasive scent of roasted turkey), or if there’s pressure for everyone to sample everything or to take second or third helpings. So much can go wrong. For illustrations of the possibilities, see the Thanksgiving episodes of American situation comedies on tv. Note on the concurrence of events. November 22nd is St. Cecilia’s Day, on which we celebrate the power of music; see my 11/21/11 posting “Saint Cecilia”. Then the date was darkened by the assassination of John F. Kennedy on November 22nd, 1963. So now these occasions come always linked. And this year, it’s also Thanksgiving. The classic dessert for Thanksgiving is pumpkin pie, which I have no enthusiasm for. After that, pecan pie, which I adore. And then, I suppose, apple pie, though in this case I prefer elegant French versions over sturdy American ones. Now for something completely different: dried fruit compôte, intense and easy to cook. [AMZ’s handwriting] Remarks: oysters excellent, ditto salad. Plum pudding (Gourmet Nov. ’69) great, but needed baking instead of steaming. Fruit compote superb (NY Times Green). 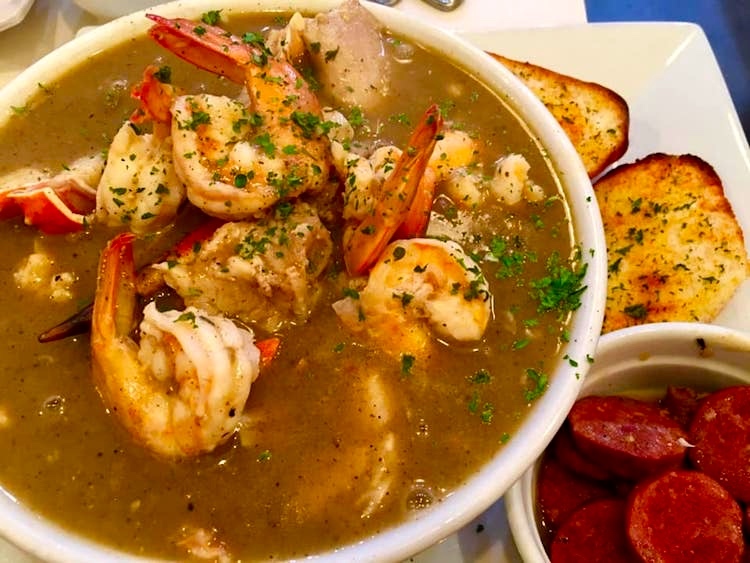 Remarks: Broth v. unexciting; not worth repeating. Turnips a bit bitter, but well sauced. Broccoli slightly overdone. I may have left the sugar out of the cake, which is an exceptionally easy recipe; if so, it’s still pretty good without sugar. Greg’s pudding excellent; sauce too alcoholic. Cranberry sauce excellent. [AMZ’s handwriting] Better wine very much better in direct comparison — complex and somewhat flinty, not at all sour. This entry was posted on November 22, 2018 at 3:22 pm and is filed under Holidays, Language and food, Language play, Linguistics in the comics, My life. You can follow any responses to this entry through the RSS 2.0 feed. You can leave a response, or trackback from your own site. Surprised to see so many names I know and some of whom I’m still in touch with. Re St. Cecilia’s Day: I see that the 2011 article mentions Benjamin Britten’s Hymn to St. Cecilia, but does not mention the fact that Nov. 22 is also Britten’s birthday.